After multiple Grammys, an Oscar, the Presidential Medal of Freedom, a Pulitzer, and most recently, the Nobel Prize for Literature, Bob Dylan has finally achieved every teenager’s dream: seeing his name in plastic outside his high school. This incredible honor, typically reserved for girl’s volleyball teams and fumigation notices, was unveiled this week outside Dylan’s alma mater, Hibbing High School, in Hibbing, Minnesota. “Congrats to Bob Zimmerman Class of 1959 Who Received A Nobel Prize In Literature,” the sign reads, a testament to the incredible heights that can be achieved by anyone who puts their mind to it, which the rest of Hibbing High’s student body will now be reminded of every goddamn day. Great. Thanks, Bob Dylan. The young Bobby Zimmerman grew up mere blocks from Hibbing High, where he famously performed a Little Richard cover in the school talent show with his band, only to have the principal cut them off for making too much of a racket. That story has become a symbol of the long and contentious relationship between Dylan and his hometown: He often talked about how happy he was to get out, and for many the resentment is mutual. As The Telegraph once reported, the last time Dylan went anywhere near Hibbing High was for a class reunion in 1969, where a few of his male classmates apparently laid into him. 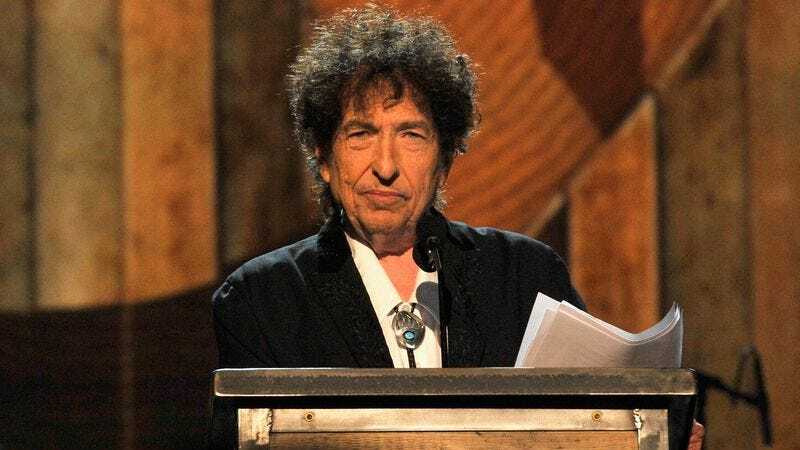 It was a humiliation that forced Dylan to flee the reunion in shame, then spend the next 47 years being one of the most important and influential voices in American culture. And as we found out when The A.V. Club visited Hibbing for our Pop Pilgrims series, the school barely acknowledges its Dylan connection, while his presence in the city itself is more or less limited to a single bar named Zimmy’s. (Most Hibbing residents are far more proud that Kevin McHale grew up there, and way more into Gary Puckett.) So, in a way, this sign is actually a huge step—though Hibbing High’s Facebook page still takes pains to say, “We at HHS are proud of all our graduates,” whether they’re a Nobel Prize-winning musical icon or just Dave, who has a pretty successful roofing business.